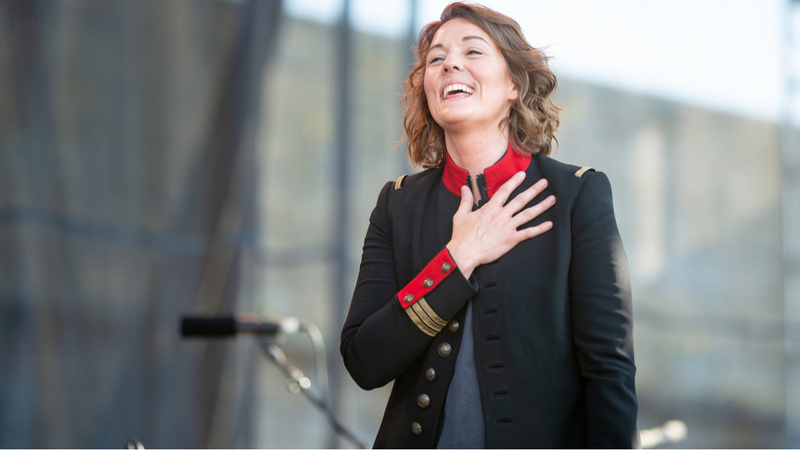 The family spirit of the Newport Folk Festival is solid in Brandi Carlile's hands. She formed her own musical family with Phil and Tim Hanseroth years ago, and now they all tour together with their wives and children (they even make an appearance on the Newport stage). Stemming out from there, Carlile has fostered a living, breathing collaborative network of artists, walking the walk by showing up early and staying late to perform with her friends. Carlile was all over the festival, performing with Margo Price, Lucius, The Lone Bellow, Mumford and Sons and more. It's all part of a great year, as By the Way, I Forgive You has brought even more fans into the Bramily. Her Sunday evening Newport set was pure celebration, as if she soaked up all that sunshine and love and poured it back over the crowd. The dynamic song list included several new tunes, older faves, and a couple nods to past inspiration, with covers of Joni Mitchell's "A Case of You" and a Led-Zep-fierce rendition of Joan Baez's "Babe, I'm Gonna Leave You." "Babe, Im Gonna Leave You"